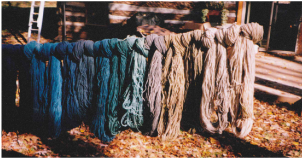 Natural dyes create the most beautiful colors, while creating no harm to the earth and all of life.Natural fibers take natural dyes beautifully. A full rainbow of colors can be achieved using no harmful chemicals. 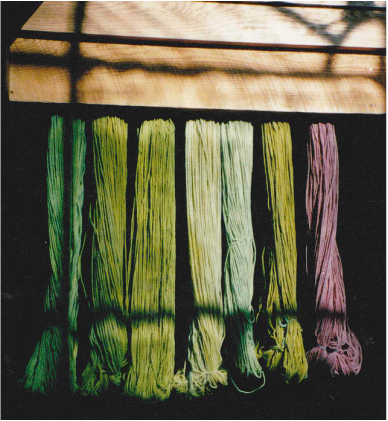 Working with natural dyes is pleasant and the dyestuffs lend creativity and inspiration to the process. I love growing and gathering the dye plants. I love preparing the dyebath and smelling the earthy aromas. When I look at a skein of yarn or fabric that I have dyed, the delightful memory of the process is always there, from gathering goldenrod blossoms in the warm sun on a late summer day to meal preparations from which onion skins are saved for the dyepot. The eyes do no tire of gazing upon colors from nature, just as they do not tire of gazing upon a sunlit field of flowers in bloom. The process of collecting and dyeing with bits of earth, and in the process doing no harm to the earth, nourishes my soul. * Naturally dyed colors radiate light energy, as do the living plants from which they come. * Vibrations affect all life. 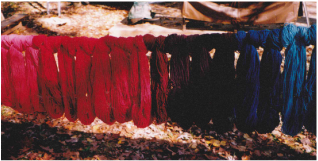 The vibrations of the living sources of natural dyes interact with the energy fields of all life. * Naturally dyed colors are living colors, alive with the life that made them, alive with the love that made them. * Life affects Life. The power of colors is at its maximum when the source is living. have created them. This is the possibility with natural dyes. For the colors radiate light energy just as do living flowers. Natural fibers come from animals and plants of the earth, including sheep (wool), goats (mohair), alpaca, llama, silk, organically grown cotton, hemp, nettle and flax. These fibers have vitality and healing properties of their own. They breathe and are healthy to wear against your skin. When raised and produced consciously, beauty is created with no harm to the earth and all of life. Artistic and environmentally conscious dyer India Flint writes, "Synthetic textiles and synthetic dyes are silent contributors to ill health...If a plastic PET water bottle cannot safely be re-used more than a few times before it begins to break down and releases phthalates into its contents, how can the wearing of polyester fabrics possibly be safe? Each time that easy-care synthetic polo shirt is flung into a washing machine the laundering process is making a further contribution towards the breakdown of the textile so that millions of tiny fibres find their way onto the skin, our largest and most easily accessible organ. It's not a pretty thought." BAMBOO/MODAL/TENCEL- all three of these fabrics use the same process to turn a wood pulp into fabric. This process uses a dangerous chemical called carbon disulphide to transform the plant into liquid and then into fibers to be spun into fabric. These extremely toxic chemicals can cause a plethora of health problems and neural disorders for the manufacturing workers. The new spin being put on the public's growing awareness of this chemical is that it operates on a closed loop system. While this sounds better, who wants a fabric saturated in a toxic chemical? Bamboo is a fantastic renewable resource that is a wonderful choice for hardwood floors, cabinets, pencils, basically anything that doesn't need too much processing. SOY FABRIC - 80% of the soy we eat and wear is genetically modified, making it a boycott-able product in general. However, adding to this is the fact that it’s in just about everything we eat, especially processed foods, and the demand has grown so high that farmers are razing the Rainforest on a catastrophic scale in order to grow enough to meet our consumption needs. Soy fabrics are very unsustainable. Wonderful wool – keeps you dry even in the rain and snow, keeps you warm, breathes, and glows with the colors of natural dyes. Wool doesn’t need to be washed often. Wool naturally resists dirt. If it has picked up undesirable scents, simply air it on a line in the wind. Spot clean as needed, with warm water and a natural wool soap (Eucalan) on a cloth. Line dry in fresh air. Store your woolens with herbs/essential oils to repel moths. Silk should be cared for in much the same way as wool, airing and spot cleaning as needed. A neutral pH soap should be used for silk, castile soap being one option. Neutral pH soap is important to use with some natural dyes that are sensitive to pH changes. Not only are many herbs insecticidal, but the aroma of an herbal mixture will also repel the moth. Moths rely on their sense of smell to find the wool where they lay their eggs. Rather than smelling wool the female moth will smell herbs and be on her way. Here is a moth-repelling recipe that blends the leaves and flowers of herbs with essential oils. It's an inexpensive and safe alternative to mothballs because the mixture is all-natural. Toss the essential oils gently with dried herbs. Fill sachets or a bowl with the mixture and place in your closet, wardrobe or drawers. 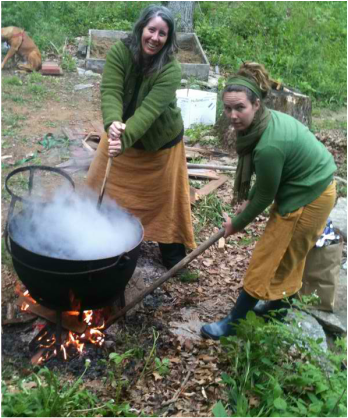 enjoying the rich, earthy process of making black walnut dye over a fire in an iron kettle! in a rainbow of colors!